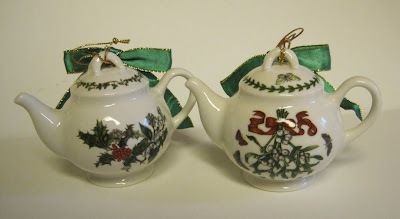 I'm sure I must have used up my allotment of blog posts about tea-themed ornaments for the year, so please forgive me for adding just one more. 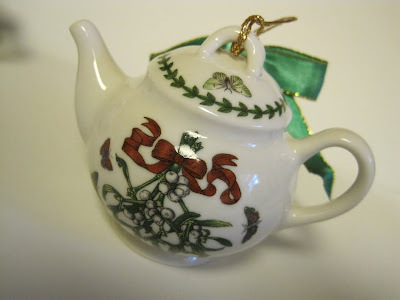 I always love to hear where others find tea ornaments, so I feel compelled to share sources in case one of these ornaments strikes your fancy as well. 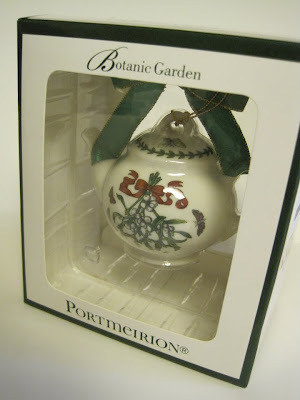 I found this teacup ornament from Portmeirion at a T.J. Maxx in Kennesaw, and it matches the two teapot ornaments I found at my T.J. Maxx here in Newnan. Sweet! 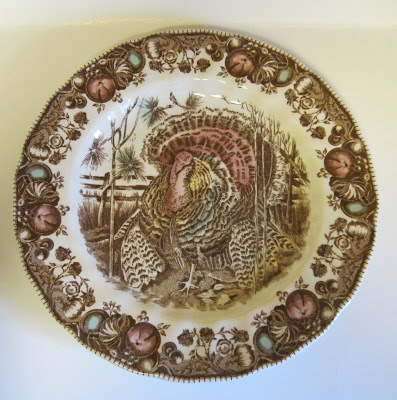 T.J. was also the source of this Spode ornament. And thanks to a tip from ParTea lady, I made a point of going through all the blue boxes of Wedgwood ornaments at the Kennesaw Marshalls until I found this Wedgwood teapot ornament, the only one they had! I have been wanting one of these for years. At an antique mall, I found a 2001 Hallmark teacup ornament in the box. 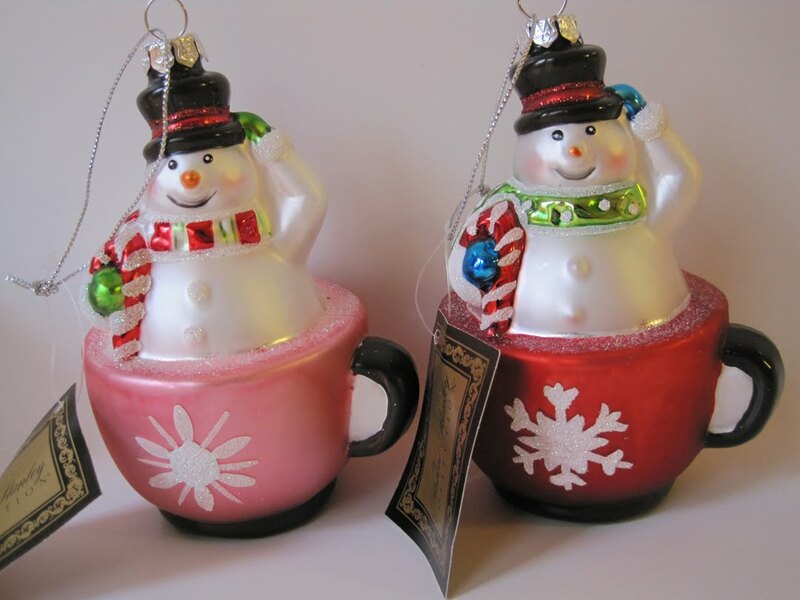 A little online research revealed that Hallmark has made quite a few tea-themed ornaments over the years, and I've collected three so far. as well as a new one with Santa in a teacup. Cute! Finally, this Cracker Barrel ornament isn't tea-themed, but as soon as I saw this angel, it occurred to me my crafty friends might have fun making similar ornaments using vintage handkerchiefs. Here is the back of the angel, but I think I would probably resist cutting my vintage handkerchiefs. And this weekend, it's finally going to be time to put up my Christmas trees! While I don't enjoy Black Friday shopping, I very much enjoyed my regular Saturday shopping with my mother and aunt over the weekend. We went to the Kennesaw area and hit a HomeGoods, T.J. Maxx and Marshalls, and I was really surprised by how calm these stores were. HomeGoods was practically deserted, and T.J. and Marshalls didn't seem as busy to me as they usually are. Since we had just gotten our Christmas bonuses at work, I took advantage of the Saturday shopping to make a huge dent in my gift list, and of course I treated myself to a few small goodies as well, most of them tea-related. One of my favorites was this bone china teacup in a chintz holly pattern I found at Marshalls. Not bad for $6.99, and just right for sipping some new Christmas teas! I'm still working my way through the nice gift box Stash Tea sent recently, and the first one I sampled was Merry Mint, a green tea. I didn't read the ingredient list and had assumed the mint flavor was peppermint, but a nice spearment flavor greeted me instead! This tea does have peppermint in it as well, but it was nice to find spearmint flavor in a tea. 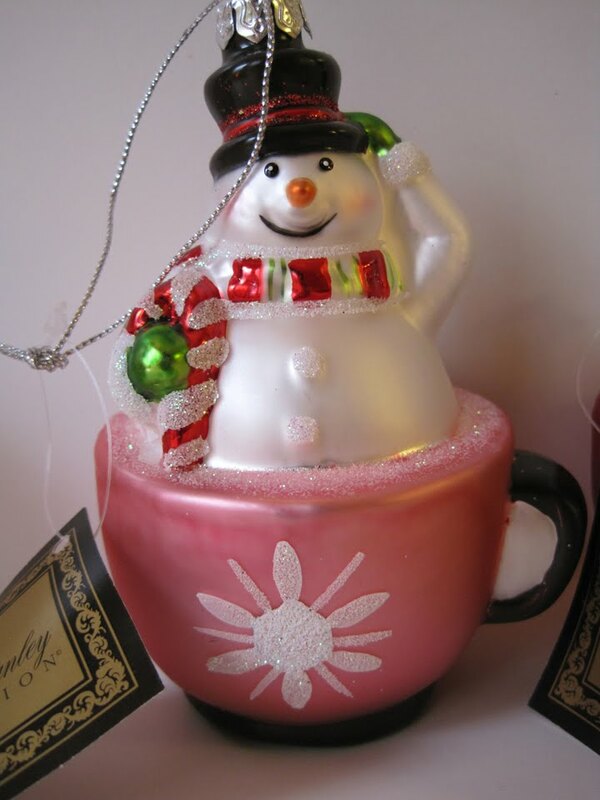 The White Christmas blend contains white tea, peppermint and ginger. That sounded like an odd combination to me, but as a great fan of ginger, I really enjoyed this blend as well. Got any Christmas blends to recommend? Have teacup, will sip! Tea and Books Saturday #48 - "A Cozy Book of Herbal Teas"
While spending a miserable two days in bed with the flu last weekend, I suddenly found I had no desire for any beverage but herbal or spice blend teas. The hot liquid was such a relief to my throat, and I can't help thinking one reason I bounced back in plenty of time for Thanksgiving was that I drank so much tea! 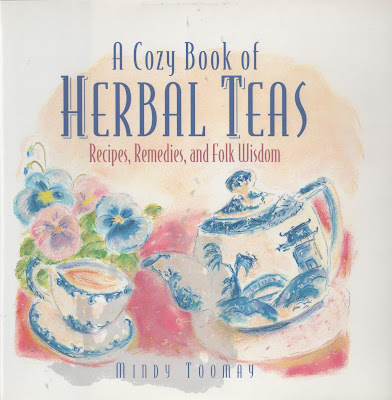 That set me to thinking about drinking more teas this year as preventive medicine, so I was happy to be able to consult a book that's been waiting on my shelf for a while, Mindy Toomay's "A Cozy Book of Herbal Teas: Recipes, Remedies, and Folk Wisdom." I really like this author's clear, common-sense approach to using herbal teas. She writes, "The debate about the efficacy and safety of herbs as medicines is not likely to be resolved anytime soon … I maintain that the only meaningful approach to the question is to experiment cautiously on one's own, as many herbal proponents have done. Personal experience often convinces us that benefit can be derived from the careful use of certain herbs when we are faced with minor illness. The key word here is careful. Herbs, as well as drugs, must be used with respect." Toomay's book focuses on well-known, readily-available herbs that can be used to make simple herbal teas. Chamomile, cinnamon, fennel, ginger, lavender, lemon balm and rosemary are some of the ones she favors. She also includes tidbits on the historical uses of herbs. I enjoyed learning that Thomas Jefferson prized lemon balm in the garden at Monticello, and that in Chinese medicine, licorice is considered "the grandfather of herbs." 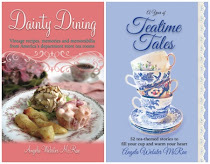 The book also includes a few recipes for teatime treats that pair well with herbal teas. I only wish I had read this book before I started gardening last year, because I definitely would have harvested and dried my own herbs as she recommends. And now, if you'll excuse me, I'm off to prepare a cup of chamomile tea! Much as I always love to shop, friends are sometimes surprised to find I don't leave the house on Black Friday. It's this simple: I have yet to see the television set or laptop computer or yes, even a teapot that I'm willing to lose my life for. Besides, it's more fun staying home, crafting and drinking tea as I watch news coverage of the most chaotic malls in America. It's become a tradition for me! But today, if you're out and about and near a T.J. Maxx, you might want to know that my local store had some of these Portmeirion teapot ornaments. The patterns are The Holly and the Ivy, at left, and Botanic Garden. I got one of each design for myself, and two more to give away as door prizes at next week's Tea for Toys here in Newnan. 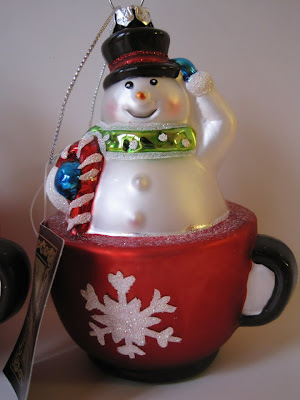 I loved seeing that distinctive green ring around the top, and at $6.99 these were a bit more affordable than some of the other "brand name" teapot ornaments. So I have to ask: Are you a Black Friday shopper? Of course if you are, you probably aren't reading any blogs this morning! Whichever way you roll, I hope you enjoy this day-after-Thanksgiving, friends! 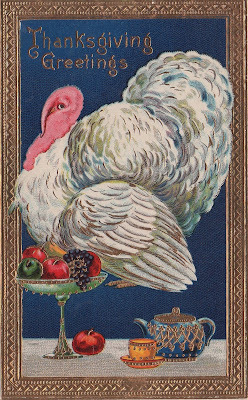 Happy Thanksgiving to all my tea friends! I am so thankful for your friendship! 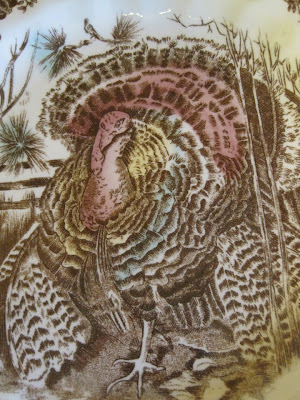 For years I have wanted to start collecting an official "Thanksgiving" pattern of dishes, and this year I finally made my choice, which features His Majesty, shown here. His Majesty is also the name of this Johnson Brothers pattern, and this year I've started my collection with the dinner plates, which will obviously be the stars of my Thanksgiving table! I love the detail around the rim, including the brown floral design which looks almost like toile to me. I haven't splurged on the matching teacups or mugs just yet (though you can bet the teapot is at the top of my wish list! 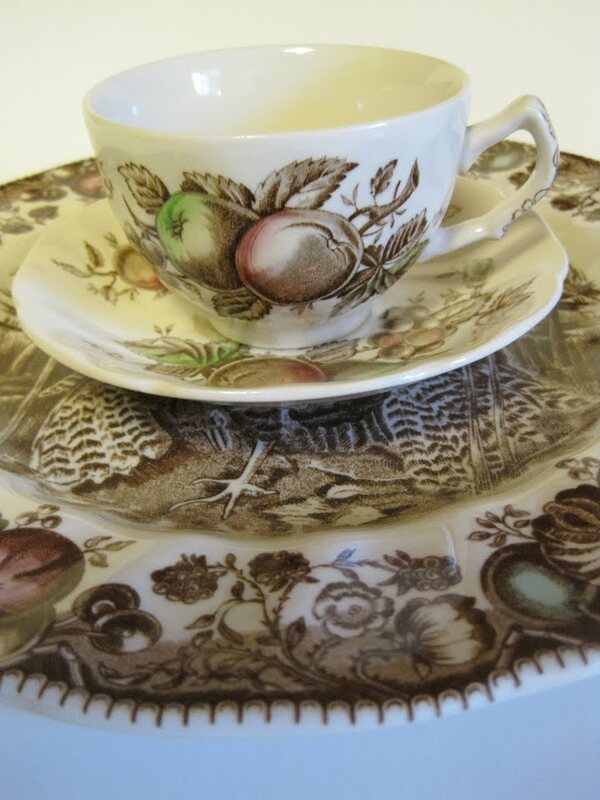 ), but I do have some Johnson Brothers Harvest Time cups and saucers, which I think will do just fine for now. Do you have special dishes for Thanksgiving? I'd love to hear what you use! 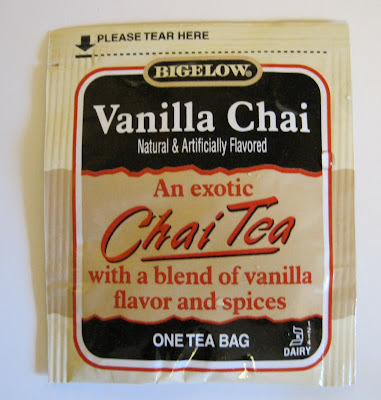 If you're like me, there are certain flavors of tea you drink only at certain times of the year. 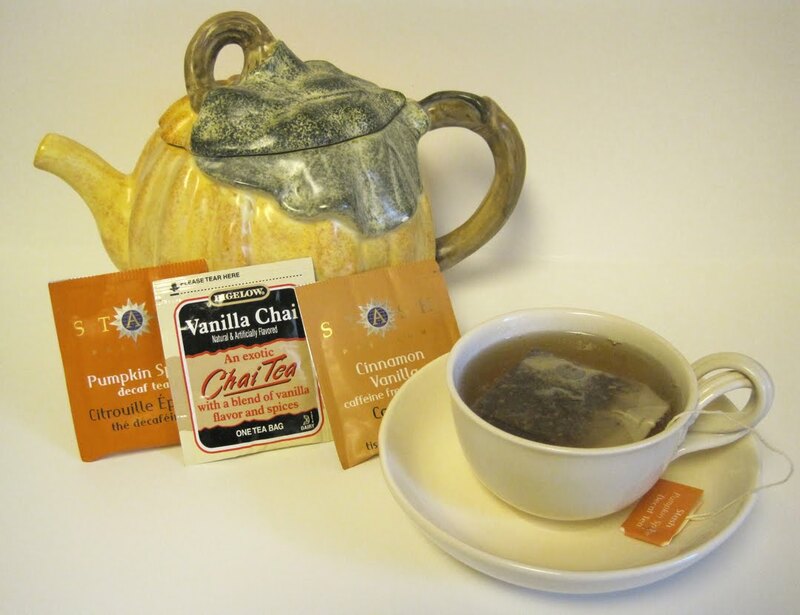 Pumpkin, cinnamon and flavored chai teas are some of my favorite ones for fall, and I've recently been sampling some new teas in these flavors. 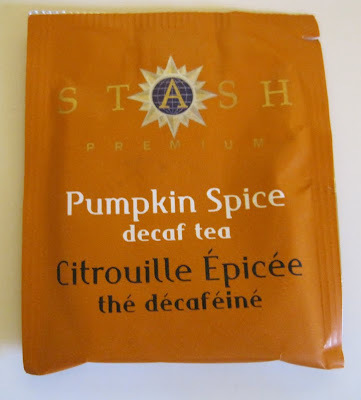 Stash Tea sent me a gift box of new teas last week, and the first one I tried was this Pumpkin Spice blend. You know how you go into a nice gift shop at this time of year and you drink in the scent of pumpkin candles and cinnamon potpourri? This tea is like having that experience in your teacup. It is wonderful! At the grocery store I found a new Bigelow Tea, Vanilla Chai. I really like the addition of the vanilla flavor to the chai, and these are the teabags I've been tucking into some of my correspondence this fall. 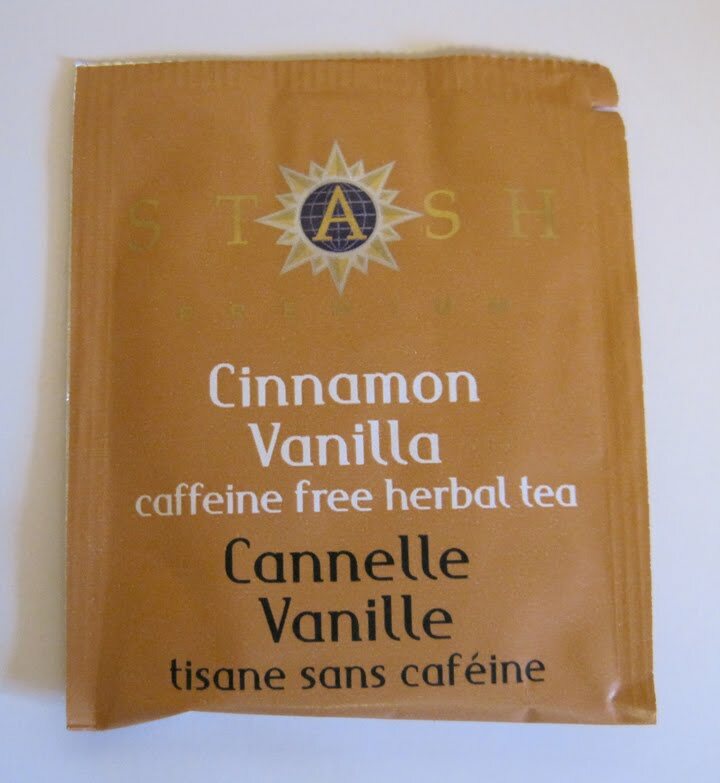 Finally, Stash Tea's Cinnamon Vanilla is another delicious spice blend of tea. The cinnamon flavor is fairly subtle, not overpowering, and I greatly enjoyed this tea. 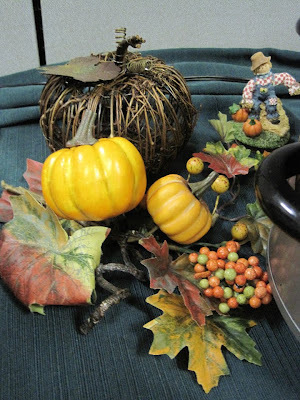 So what fall flavors are you enjoying this year? 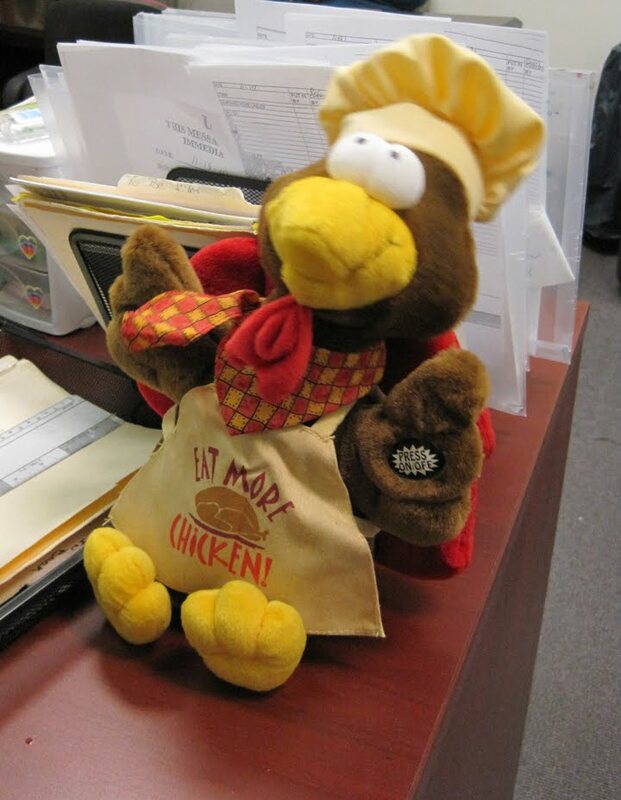 One of my co-workers recently commented that she is so distraught over the retail world's fast forward from Halloween to Christmas, she wants to write an obit for Thanksgiving. I thought that was both funny and sad but true! So this week, I am going to try very hard to focus on Thanksgiving and not skip ahead to Christmas. 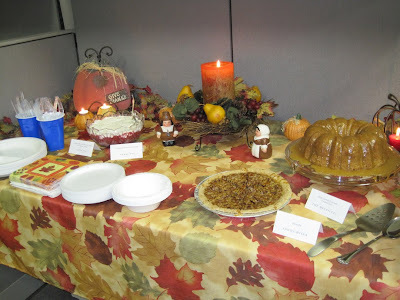 I thought I'd begin by sharing the yummy and easy cake recipe I made for the office Thanksgiving luncheon last week. I found the recipe for Pecan Spice Cake with Maple Frosting in Cooking Light magazine. 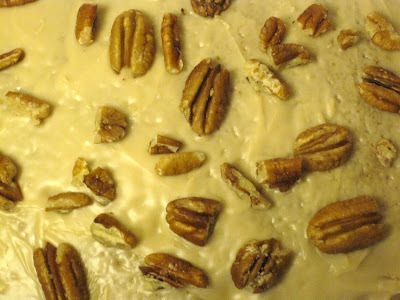 Couldn't have been easier to bake, tasted great, and only a portion of one slice was left after the office luncheon! 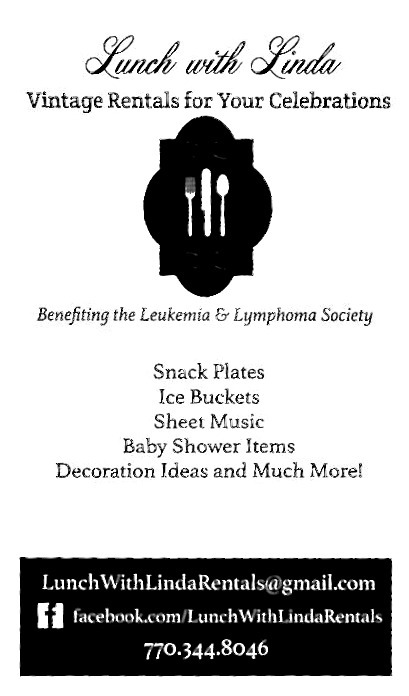 We have sooooo many desserts at these luncheons, I was pretty amazed (and more than a little happy!) that almost all my cake got eaten. 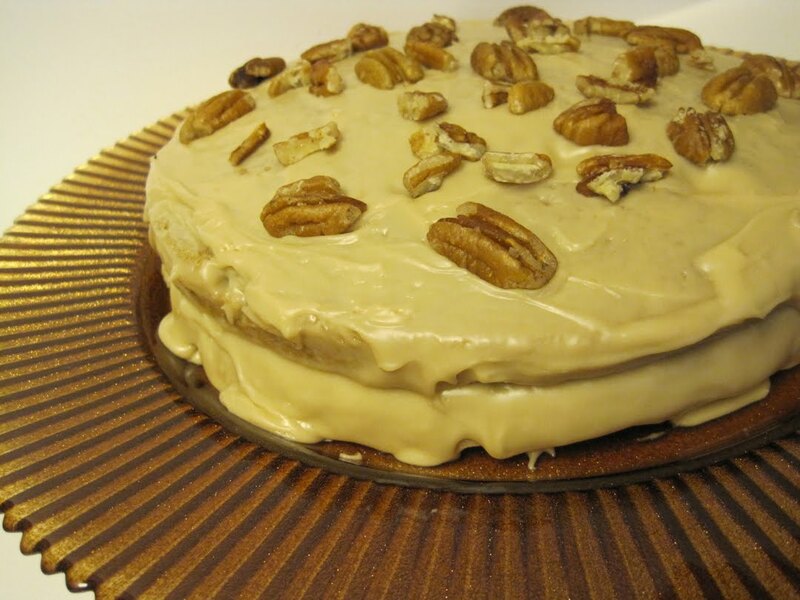 I plan to make another one for my family to enjoy on Thursday. The Thanksgiving luncheon is one where food is served by department throughout the building. 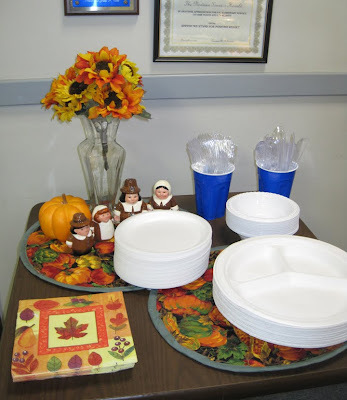 Near the entry to the newsroom, some festive Thanksgiving linens and figural pieces spruce up the table with the plates and utensils. 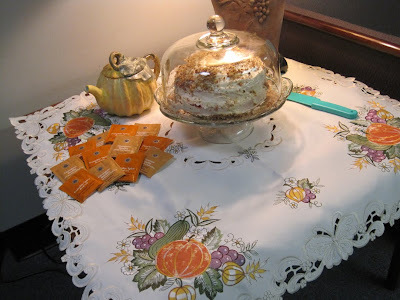 I brought a teapot, tablecloth and some teas to brighten this little corner where my friend Stacie's Red Velvet Cake was on display. Several people (OK, including me) tucked into the offerings in the Classified Department pre-luncheon, which is supposed to be a no-no, but I considered the Georgia Caviar (a salsa-like dish made with black-eyed peas) an appetizer. 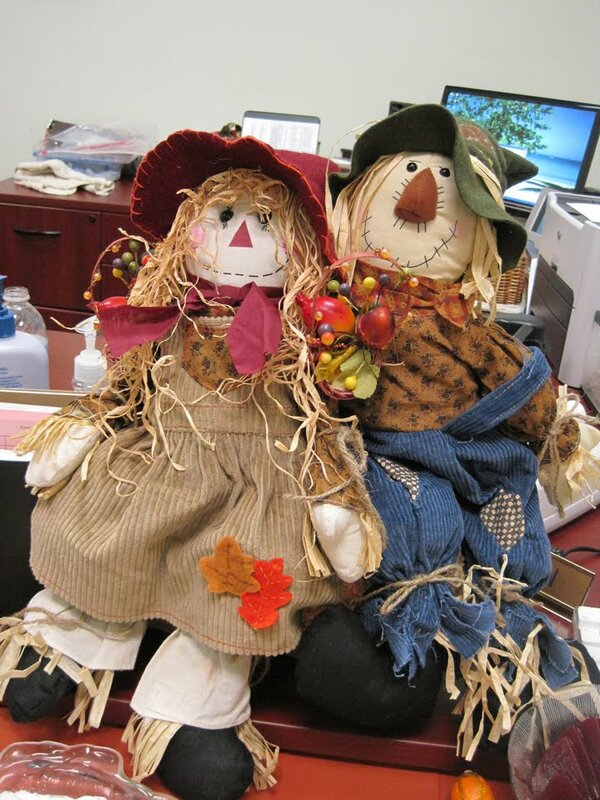 Classifieds also had these cute decorations. I really like the pumpkin at back! And last but not least, the talented folks in Graphics once again outdid themselves with a lovely display and graphically beautiful display labels on their dishes. 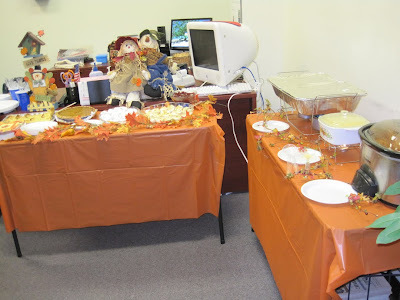 I am certainly *thankful* for the good times at our annual Thanksgiving luncheon! Tea and Books Saturday #47 - "The World of Tea"
By Thomas J. Lipton, Inc. True or False: "Green tea is picked when the leaves are not quite ripe, and black tea when the leaves are fully ripened." The answer is false, of course, but that's one of the questions from the Two-Minute Test on the opening page of this small book, one of my eBay finds from this year. Now that I've read that new bio of Sir Thomas Lipton, I figured this book probably wouldn't have anything new to offer, but happily I was wrong. 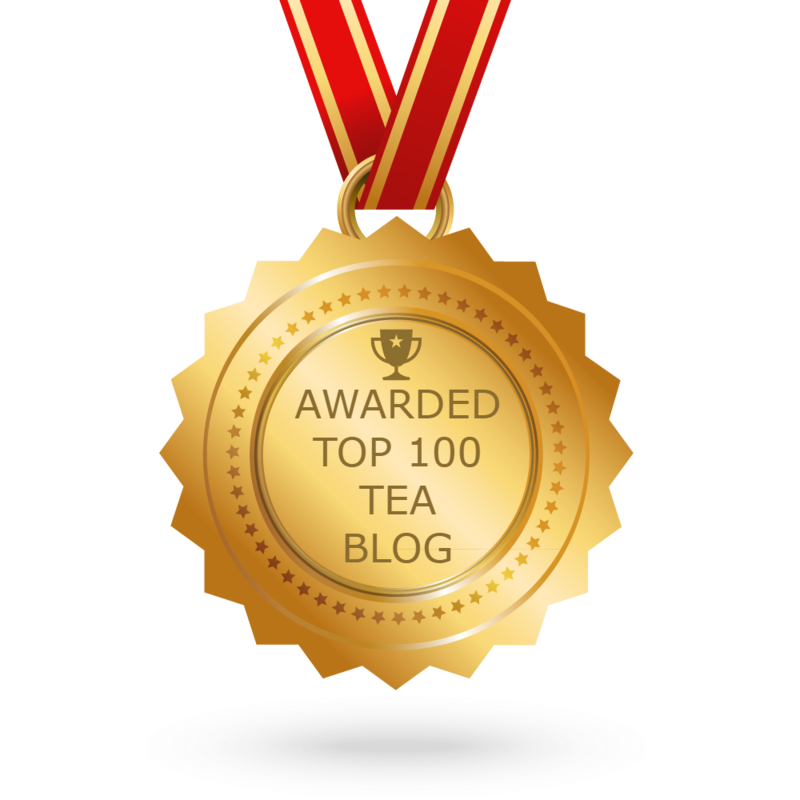 For one thing, I learned that by the time Lipton tea reaches my teacup, it has been tested by seven different people a total of at least 14 times. Impressive! Because there is no date listed, I am guessing this book was published in the seventies or early eighties since the graphics (such as a redheaded woman's fluffy "winged" hairstyle) look like others I've seen from that period. 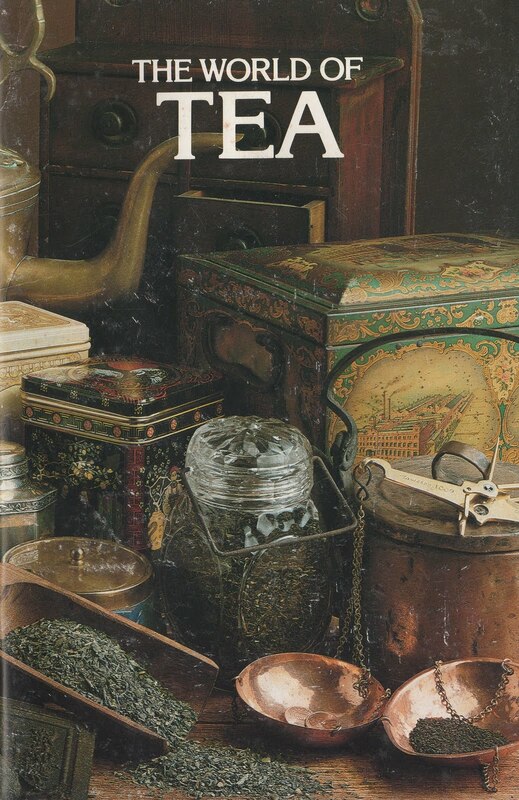 The book is also dated by its claim that no tea is commercially grown in North America. Today it is well known that tea is commercially grown at the Charleston Tea Plantation in South Carolina. The book contained a great brewing tip I've never read before. 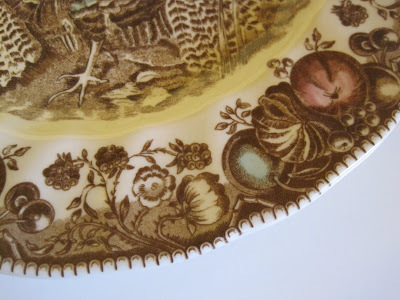 "Whenever possible, if brewing tea by the cup, use the saucer to cover the cup and retain the heat." 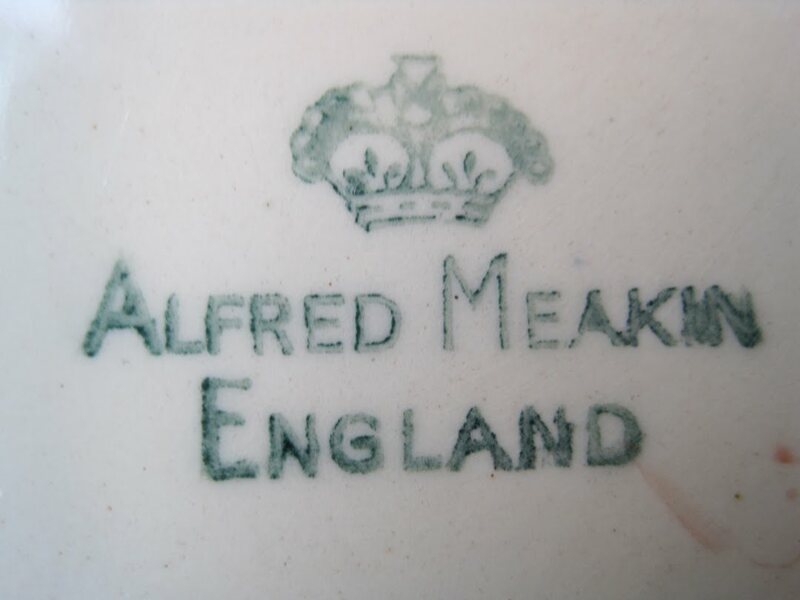 I do have a few of those special lidded tea mugs, but I have saucers readily available as well! 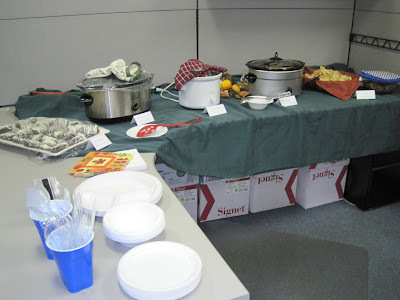 Also included are a few recipes for tea drinks such as Tea 'n Cream Toddy (stir 1 tablespoon maple syrup into brewed tea and top with a scoop of vanilla ice cream), Sangria Cup, Ambrosia Shake, Lime Delight and more. All in all, a fun little read! 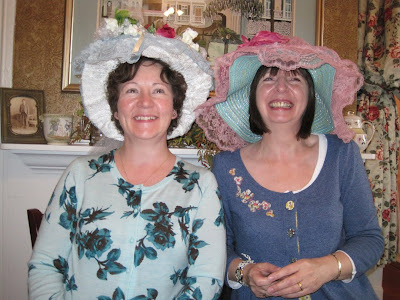 New tea friends from S.C. ... and Scotland! What an incredibly fun time I had yesterday! I finally got to meet my tea friend Belinda from Greenville, S.C., a lovely lady I'd gotten to know here in the tea world but whom I'd never actually met face to face. Here are Belinda (at right) and myself at Holly Cottage Tearoom here in Newnan! Belinda was actually enjoying a girlfriend trip to Holly Cottage with four other ladies, and I can honestly say I loved them all immediately! 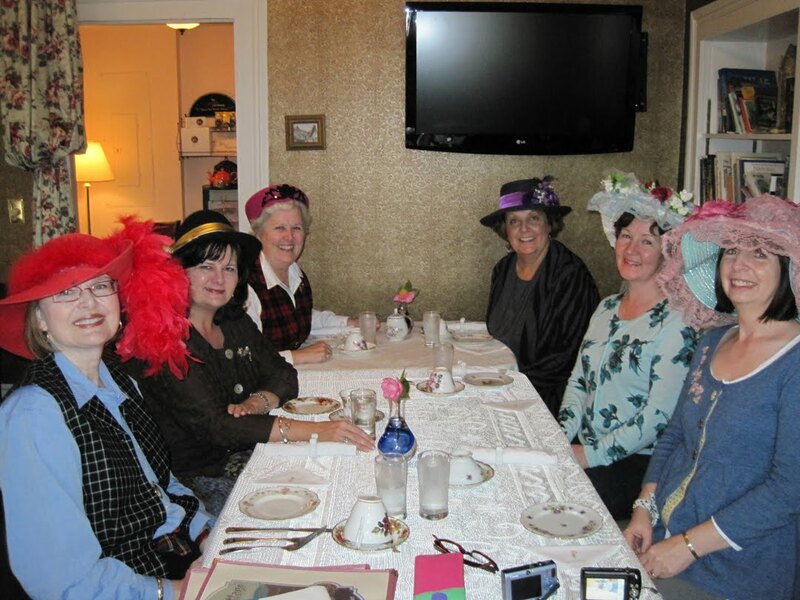 Clockwise from left are Sharon, me, Belinda, Phyllis, Ruth and Anne. 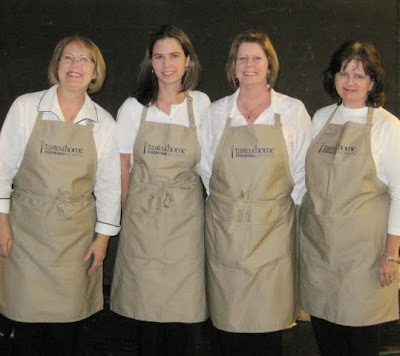 Ruth is actually the pastor's wife at the Presbyterian church these ladies attend together. I greatly enjoyed hearing about their work with the tea ministry and learning who does what. Belinda is the one who first had a heart for this ministry, and Phyllis joked that she and Belinda were doing "research" by eating at this tearoom. 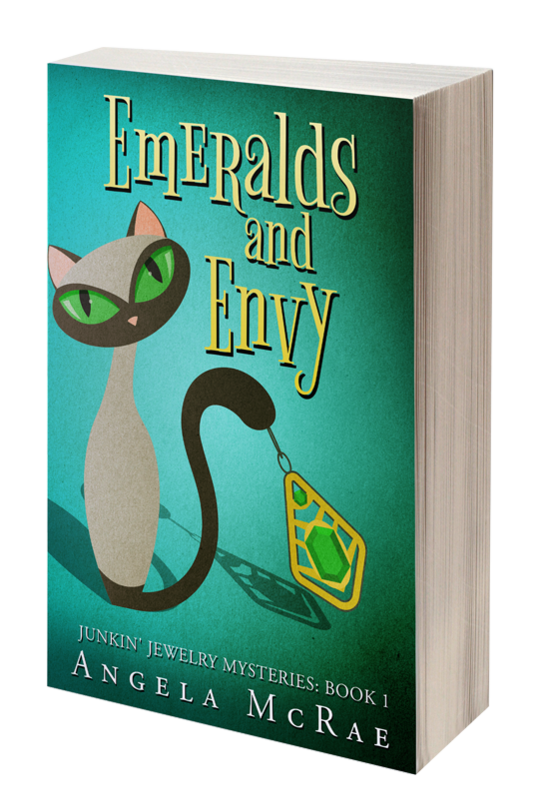 I already knew that Belinda and I both enjoy cooking teatime treats, and I learned that Phyllis and I are both huge fans of Jan Karon (I'm in the beginning of Jan's newest book, and Phyllis says some surprises are in store). Sharon, I learned, washes the dishes after the church teas, and she and I immediately bonded as fellow firstborns. It is amazing how much you can learn about a group of ladies in such a short time when they are as friendly and welcoming as these were! 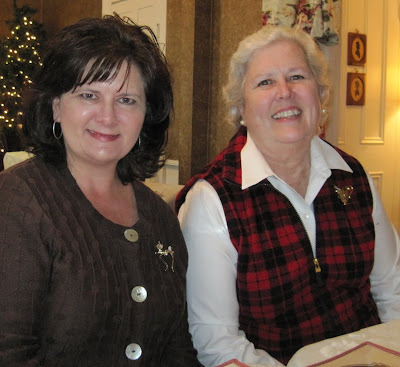 I was intrigued to learn the ladies' pastor is Scottish, and I so enjoyed getting to hear his wife Ruth's wonderful accent, along with that of her equally delightful friend Anne, who was visiting from Scotland and joined these ladies for the trip. (I should have photographed her standing, as she wore a beautiful knit top with a teapot near the hem!) Here, Ruth and Anne are going all out in the hat department with their "Southern belle" look. Our time together passed all too quickly, but I certainly was blessed to get to spend a few hours with such a fun bunch of tea-loving ladies! Now I've been to Hobby Lobby many times since they first put out their Christmas wares months ago, but only this week did I come across these cute new glass teacup ornaments. The pink one, of course, is my favorite! Congrats to William & Kate ... but when's the date? We interrupt this regularly-scheduled blogcast to discuss yesterday's exciting news from across the pond: Prince William and Kate Middleton are engaged! For years now I've dreamed of holding a Royal Wedding Tea on the day William marries. Seriously! Friends and I have already discussed the fact that even if it's at 5 a.m., we're getting together for tea and wedding watching. So now that the event is officially announced for next spring or summer (although I *do* wish I knew the exact date! ), I'm ready to begin gathering the necessary items for the tea. 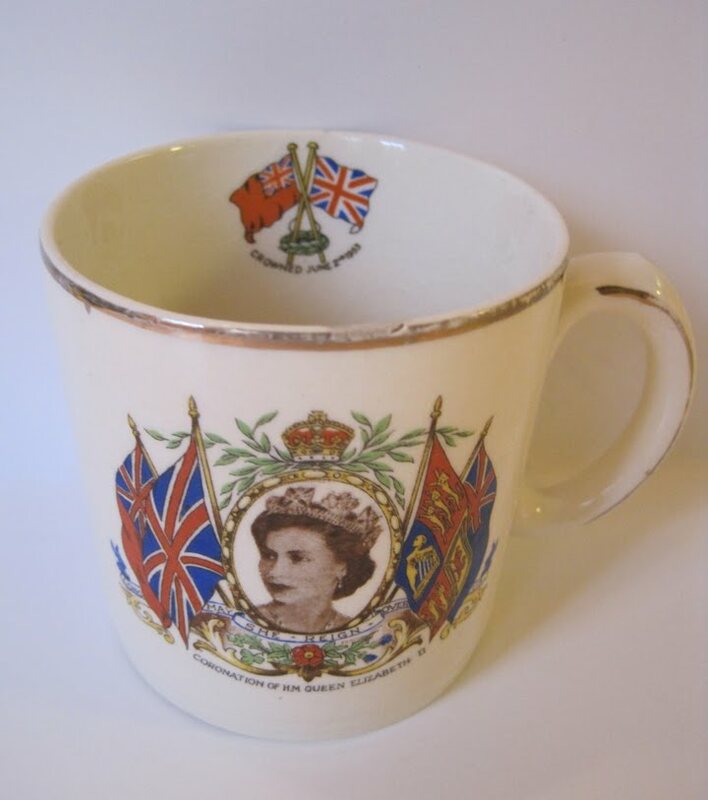 I'll especially be on the lookout for royal commemoratives, those wares manufactured expressly to commemorate a royal event. 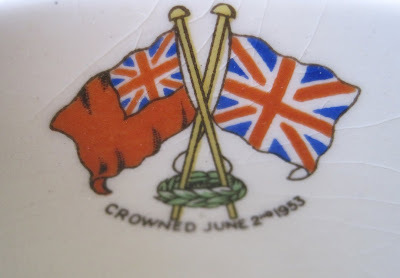 This vintage mug is a piece I found at an antique mall in Florida last year, and it marked the coronation of Queen Elizabeth in 1953. 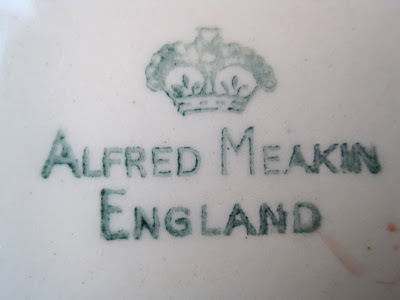 Alfred Meakin was the maker of this mug, and I'm eager to see who will be making the cups, saucers, mugs and tea towels that will commemorate this upcoming royal event. Are you excited about the royal wedding? Will you be watching? 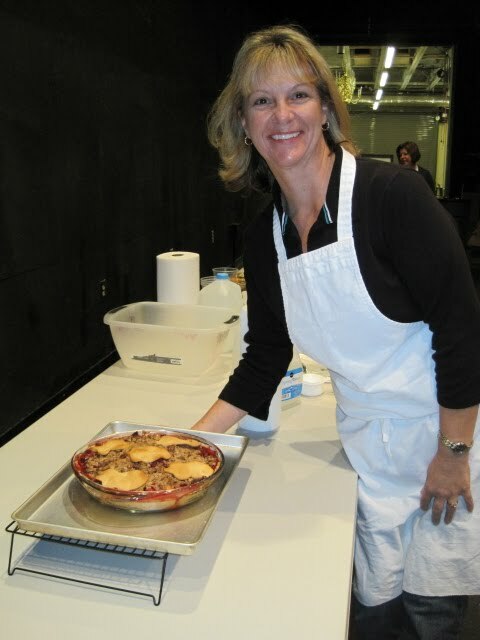 Ms. Hennes! If you'll send me your snail mail address via the e-mail button at right, I'll get these headed your way. Congrats! 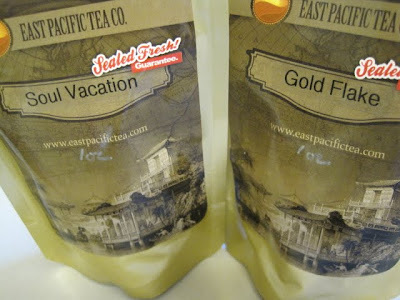 Recently I sampled two more teas from the newly-discovered East Pacific Tea Co. I enjoyed them both, and not just for the taste! I made a point of not going online to see what kind of tea this was before I opened the packet of Soul Vacation. To me, seeing the different varieties of whole leaf tea is one of the quiet pleasures of teatime. 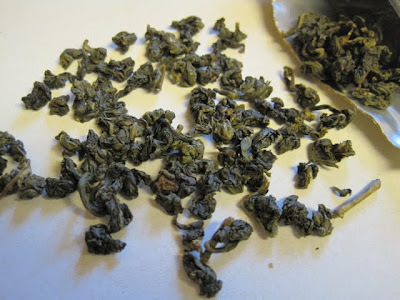 These tightly furled tea leaves opened gracefully and produced a delicious, rich tasting Formosa Oolong. 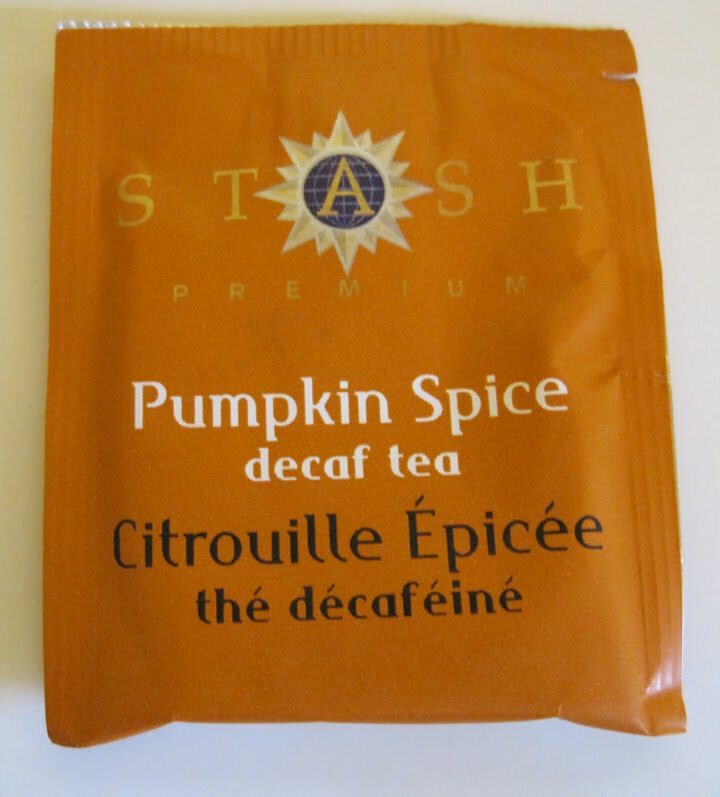 I had four or five steepings of this tea the first time I sampled it, and each one was just delicious! Again, I decided to let this Gold Flake tea surprise me, but one look at the wispy black leaves with bits of golden leaf told me this was a black tea. 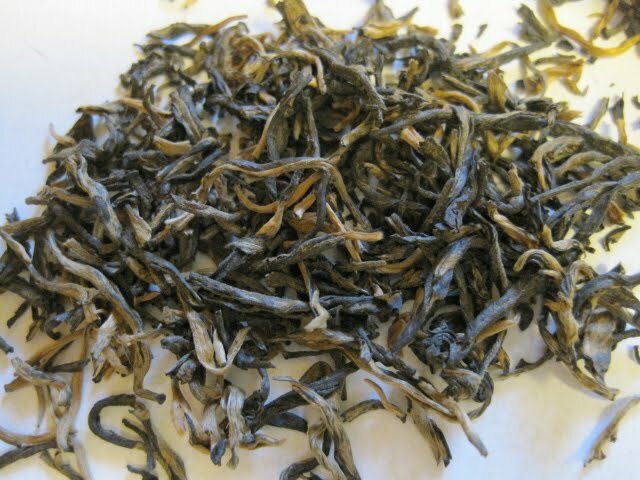 When I did look up this tea online, I was not surprised to learn it was from the Yunnan province of China. This was a brisk tea without a trace of astringency, and I like it very much. As with the Soul Vacation tea, I was pleased to find I could get several steepings from the tea. I've been quite pleased with the samples I recently tried from East Pacific Tea Co., so if you're not acquainted with their teas, please check them out here! Last Thursday, my friend and colleague Deberah and I once again helped with preparations for the Taste of Home Cooking School. 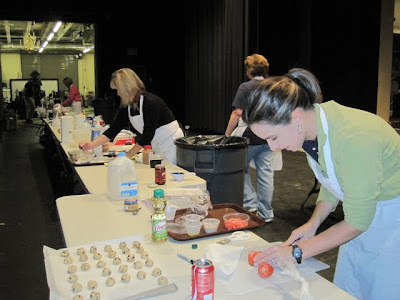 The Times-Herald and Newnan-Coweta Magazine help sponsor the show each year, and it is always a huge hit in our community and the surrounding area. Tables are set up backstage at the Centre for the Performing and Visual Arts in Newnan, and this is what it looks like beginning about 8:30 a.m., so a lot of work is already underway by the time of that 6:30 p.m. show! 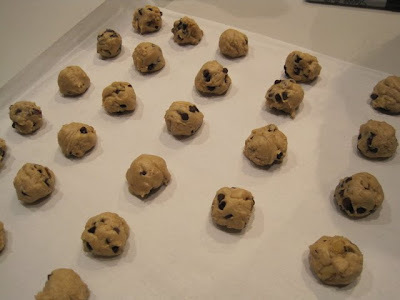 The recipe I made this year was Cookie Dough Truffles, and I must say the (egg-free) batter I managed to get a bite of was just delicious! 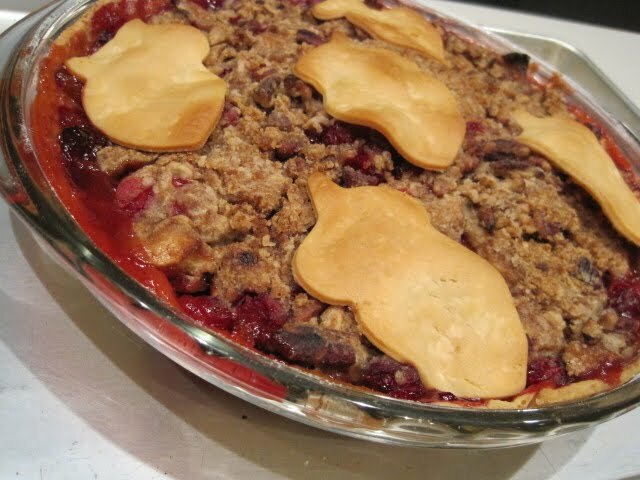 I always use a teaspoon when I make cookies or candies, but I loved using the show's small spring-handled scoop instead. It made uniformly sized balls quite easily, so that's a gadget I do believe I will invest in. 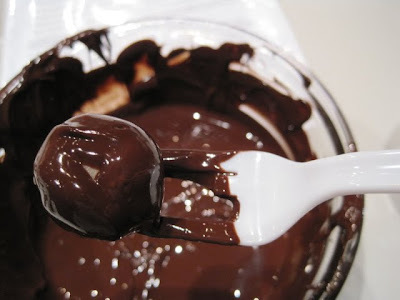 After the truffles were refrigerated for a short while, it was time to dip them in melted chocolate. Michelle Roberts, the culinary specialist who presents the show in Newnan each year, had prepared what she calls a "high tech" gadget for dipping by breaking off the middle two tines of a plastic fork. It made dipping the truffles so easy! 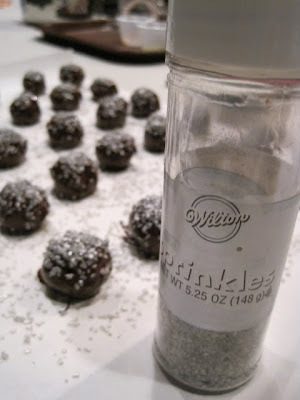 While the chocolate was still wet, I dusted the truffles with pearlized silver sprinkles from Wilton. Aren't these pretty? 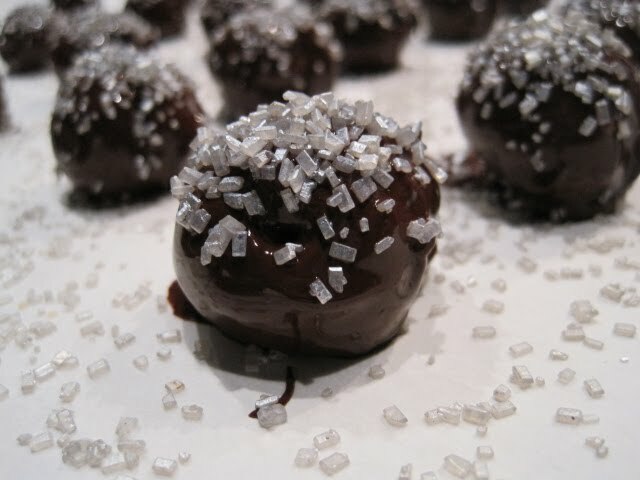 The silver sprinkles added such a festive touch, I do believe I will be embellishing my truffles and other candies this year! 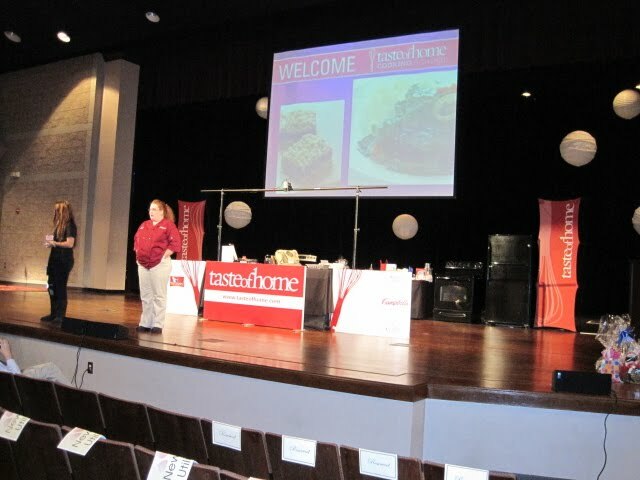 Another returning helper for this year's show was sweet Kay from Fayetteville, who is one of the Taste of Home field editors. I got hungry just watching her mix up the ingredients for the French Cranberry-Apple Pie. After going home for a few hours to rest and change into our uniforms, the four of us helpers came back to get our assignments for the evening. From left are Deberah, our new friends Anna and Leigh from United Bank, and me. 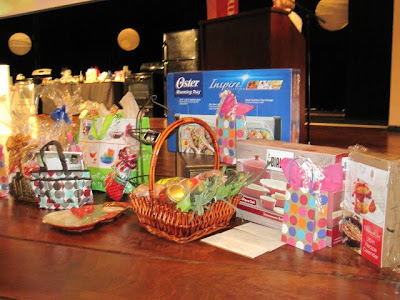 The food prepared at the show is given away as door prizes (including some terrific containers/dishes), and these were some of the other door prizes given away that night. Here's Michelle getting a soundcheck on stage right before the doors open. Soon the ladies -- and more than a few gentlemen, I noticed! 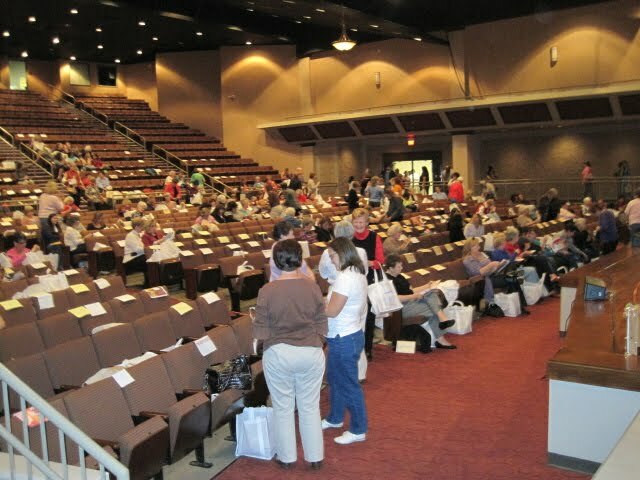 -- began filling up the auditorium. It was a fun night, and I enjoyed meeting some great new folks this year! Of course I try to look out for my blog friends, so when I was told I could take an extra set of magazines if I wanted, I grabbed two more for one of you! 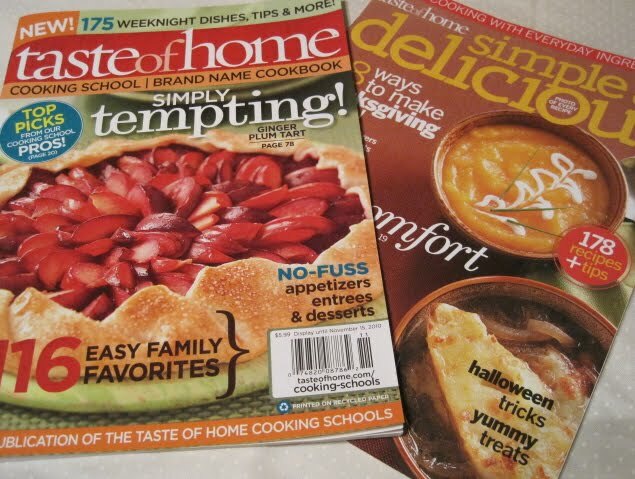 The Taste of Home Cooking School Brand Name Cookbook at left is the one that features all the recipes made at our cooking school, including the truffles and pie mentioned above. 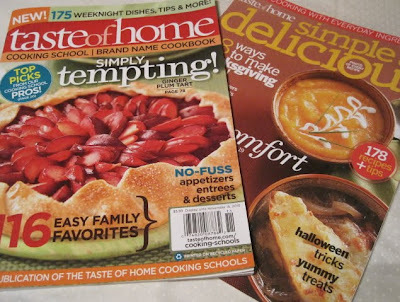 At right is the latest issue of TOH's Simple and Delicious. If you'd like to win these two magazines, just leave a comment to this post before 7 a.m. EST tomorrow. Good luck! A December 2 Tea for Toys!